Rep. Ilhan Omar (D-Minn.) got into a heated back and forth on Wednesday with special envoy to Venezuela Elliott Abrams, accusing the diplomat of being a liar and pressing him on his involvement in the Iran-Contra affair and killings in Central America during the Reagan administration. 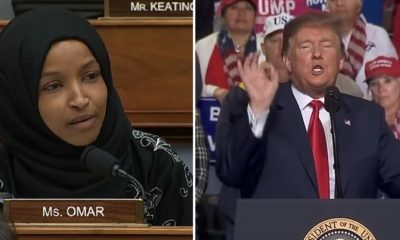 “I don’t understand why members of this committee or the American people should find any testimony that you give today to be truthful,” Omar said. In 1991, Abrams was indicted by the Iran-Contra special prosecutor for giving false testimony before Congress in 1987 about his role in illicitly raising money for the Nicaraguan Contras. He pleaded guilty to two lesser offenses of withholding evidence from Congress in order to avoid a trial and a possible jail term. “It was an attack,” Abrams responded. Omar continued, pressing Abrams repeatedly on U.S. involvement in Nicaragua and El Salvador during the Regan administration when the U.S. backed the Salvadoran military and Nicaraguan insurgents. Abrams served at the time as assistant secretary of State. Omar questioned Abrams about his past comments on the El Mozote massacre, where the Salvadoran military killed hundreds of civilians. In particular, Omar pressed Abrams about whether he was still proud of dismissing accurate reports about the El Mozote massacre, where the Salvadoran military killed hundreds of civilians in the 1980s. “Do you think that massacre was a fabulous achievement?” Omar asked. The freshman Democrat challenged him on U.S. policy in Central America during his time in the Regan administration. Omar also asked if Abrams will ensure that human rights are upheld in Venezuela under U.S. policy. Abrams was named the special envoy to Venezuela last month, shortly after the Trump administration recognized opposition leader Juan Guaidó as the country’s legitimate president. The move came as part of an increasing effort to pressure embattled President Nicolás Maduro amid an economic and humanitarian crisis in Venezuela.